Up early again this morning to get some I,Q2 writing in before two virtual web visits with the student at Buda Elementary School in Buda, Texas and their very cool librarian, Jeanne Ditta. The students were great readers and had wonderful questions about Sasquatch, I,Q, Elephant Run and my other novels. Thank you for joining me in my office this morning. It was fun having you over for a visit! A couple days ago I posted something about how to keep track of how many words you write when you’re working on a book. A teacher emailed me today and said that her students were speculating as to whether I count the words in this journal. The is answer: NO. I wish I could, but that wouldn’t be honest. And if I could count these words I would make these posts a lot longer. Some nasty little bug has crept its way into my system and I’m not feeling too well. The only reason I mention this is to keep up with my theme that authors are no different than anyone else. Once in a while we even get sick. The good news is that we also get better. And believe me, I’m looking forward to that. This slowed down work on I,Q2 today considerably, although I still manged to get in a few hours of writing. Then I took a nap…if you call three hours of sleep a nap. My favorite place to do this is in the recliner (it’s the only one we own) squeezed into the corner of my tiny office. I’ve had this black leather beauty almost twenty years. 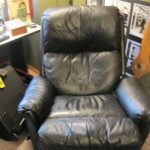 Awhile back Marie took me out to get a new one, but I couldn’t find a recliner I like as well. I guess it’s like out 1996 Four Torus. I’ll keep it until it can no longer keep me. Hope you both feel better Roland, get some rest. 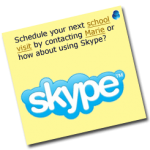 You too Marie! Thanks for visiting Buda Elementary. We love your books. You use great words and details to help us picture what is going on in the story. hey, i am so sorry that you are sick!!!! i hope you feel better so you can write more books!!! umm i dont need to be rude but i have not read any of your books but i am thinking about it!!! We liked having you visit Buda Elementary. We liked hearing about how you wrote IQ and Sasquatch. We thought it was funny when you trapped your mom by mistake! We liked how you made yourself into a cartoon. You’re a good writer. We especially like Sasquatch. Thanks for visiting us and writing about us on your blog. We liked your visit to Buda Elementary school. Our teacher is reading us Elephant Run. We love the characters and the descriptive language. We’re from Buda Elementary School. Thanks for your visit and answering all our questions. What was the hardest book to write? We want to read Sasquatch. We liked the technology you used during our video conference. We liked the cartoon faces and the power point and being able to see you. We love Cryptid Hunters. We beg to hear it all the time. We like the Mokele Mbembe part. We like Bo, the chimp too. We’re glad that you write books. You sure work hard on your writing! You are very welcome! Thank you for reading my books.